December 9, 10, 11, 12 & 13, 1975. AL wrote “When We Are Married is described as a Yorkshire farcical comedy. Yorkshire it is, comedy, certainly, farcical .. this I leave for you to decide at the final curtain. It is a play I have wanted to direct for a very long time. It is a well constructed play, written by one of our foremost playwrights and authors, J. B. Priestley. Wick Theatre Company’s ‘old campaigners’ will be very much in the thick of things when the company attempts to win the Brighton Drama League Festival for the second year running. Betty and Ralph, Frances and Brian Moulton, both husband and wife combinations, and Jean Porter between them have more than 100 years experience with Wick. 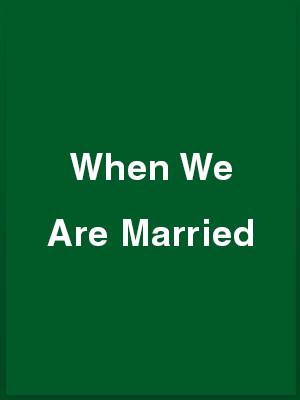 They will all be involved in When We Are Married by J. B. Priestley, Wick’s entry for the festival. The play is being presented at the Barn Hall, Southwick, from Tuesday to Saturday at 7.45p.m. [December 9-13]. Betty and Ralph have been Wick members for more than 25 years while Frances, Brian and Jean have been with the company for 21 years. Former Henley player, Audrey Laye, produces the Priestley play and will hope to be as successful as Anna Welsh. Anna produced Jean Anouilh’s The Lark, which won the best play award in last year’s festival. Wick also carried off the best actress award through Monica Joyce, and Douglas Tucker was adjudged the best actor. Douglas appears again in this year’s entry. WICK Theatre Company winners of the 1974 Brighton and district Drama Festival, should be well in the running again this year with J. B. Priestley’s When We Are Married, which opened at the Barn theatre on Tuesday. This Yorkshire comedy about three couples who are suddenly led to believe they are not legally married gives Wick the chance to show their close-knit team work under the direction of Audrey Laye. One of the strengths of the production is its experienced cast. Frances and Brian Moulton, Ralph and Betty Dawes – two real-life married couples – and Jean porter between them have well over 100 years membership with Wick. As would be expected they slot perfectly into the plot. Frances Moulton [Annie Parker] teams up with Douglas Tucker [Councillor Albert Tucker] as one couple, Betty Dawes [Clara Soppitt] is the overpowering ‘wife’ of Bill Mack [Herbert Soppitt] and Jean Porter [Maria Helliwell] takes on Keith Denyer [Alderman Joseph Helliwell]. Ralph Dawes [Rev. Clement Mercer] has a more minor rôle as the couples’ 25th wedding anniversary celebrations turn sour. It is Brian Moulton who holds the key to the whole piece. He delights as the drunken Press photographer Henry Ormonroyd and reveals at the very last that the couples are married, despite the dubious qualifications of the officiating vicar. As befits a good team effort, no performer stands head and shoulders above the rest. Each member of the cast seems well into the character of his or her part and there is fine humorous support from Sally Bacon, Peter Joyce, Mary Payne, Sheila Deasey, Roger Job and Val Burt. On Tuesday the only flaw in a relaxed evening’s entertainment was the running commentary given by the three old dears in the sixth row who seemed intent on repeating every speech amongst themselves. When We Are Married continues at the Barn Theatre Southwick, tonight [Friday] and tomorrow at 7.45 p.m. CHARACTERS drawn by J. B. Priestley from memories of his boyhood are something of Yorkshire to relish with the meat of the situation in When We Are Married. An evening is set for a staid celebration of the silver wedding of three couples in a small West Riding town. Trouble t’mill pales into insignificance when it appears that due to a technical oversight the ceremonies were illegal. The starchy respectability, as upright as the piano in this parlour of an alderman, was lovingly re-created by the Wick Theatre Company last week. The play itself is a model of farcical situations. Not a bedroom in sight or a pair of trousers removed, but this cameo of North Country town life some 65 years ago out-classes most so-called wildly funny situations. Right Yorkshire accents were maintained with remarkable convictions by the three couples. In particular, Douglas Tucker as Coun. Albert Parker conveyed the archetypal social climber out to reach mayoralty. Stalwart support came from Frances Moulton as Annie Parker, with Keith Denyer and Jean Porter as the Helliwells and Betty Dawes and Bill Mack as the Soppitts. Sally Bacon was a delightfully perky maid, Brian Moulton gave a good portrayal of the wayward press photographer, with Val Burt convincing as the cat among the pigeons. Director Audrey Laye and producer George Laye obviously had a zest for the period and play. The set, suitably over-looked by the picture Stag at Bay, perfectly evoked the era’s parlour decor down to the last armchair antimacassar.